Based solely upon box office receipts, the Quentin Tarantino/Robert Rodriguez theatrical double-feature, Grindhouse, was a less than successful endeavor. The theatrical release featured the Robert Rodriguez-helmed Planet Terror and Quentin Tarantino's Death Proof, with fake trailers placed between the two. The idea was to pay tribute to the “B” movies and movie houses that used to feature various types of exploitation films. The two films are now being released separately on DVD, the cynical would say in order to boost profits and recoup production costs. Tarantino's Death Proof made it to DVD in mid-September, and on October 16, it will be Planet Terror's turn to emerge in an extended and unrated edition. The Rodriguez film arrives in a two-disc special edition that features some of the allegedly “missing” footage that did not make it into the theatrical cut. Planet Terror is both an homage to zombie movies and one itself. The nonsensical plot features the release of a biochemical weapon that causes some people to turn into zombies simply by breathing in the vapors. Other people have to actually be bitten or ingest the blood of a zombie to turn into one themselves. The “infection” actually takes a good deal of time to spread (at least early on in the film), which allows one of the infected, a go-go dancer named Cherry Darling (Rose McGowan), to have her leg amputated in time to stop her from turning. In a brilliant move, Cherry ends up with a gun attached to her stump which she can seemingly fire at will. She and the rest of a group of misfit survivors, including a doctor (Marley Shelton) who is running away from her abusive husband (Josh Brolin) in order to reignite a lesbian relationship, and a man with a hidden past named El Wray (Freddy Rodriguez), band together in order to try and escape to Mexico. If the entire plot sounds ludicrous, there's a very valid explanation: it's supposed to be. The sole raison d'etre of the films Planet Terror is honoring is to show beautiful women, copious amounts of blood and viscera, and feature lots of cursing. It's a simple formula, and if Planet Terror is to be reviewed solely on those counts it succeeds in a big way. The film is cheesy and ridiculous and way over the top. The movie features characters like Abby, played by Naveen Andrews (Lost). Abby was helping create the zombie gas for a military organization and, for some inexplicable reason, likes to store human testicles in a glass jar. In order to better pay tribute to the grindhouse features that Rodriguez is honoring, the film contains “missing reels” (the film skips a scene or two here and there) and innumerable “scratches.” The “missing” scenes and scratches, the latter of which seem wholly computer generated and like something anyone can do using a PC these days, are far more annoying to the viewer than a tribute to bad projection and bad projectors. Even so, the film provides an amusing hour and forty-five minute diversion from the everyday insanity of the real world. The stunts, dialogue, explanations, and explosions are both fun and funny if you have ever liked B-movies. The second disc of the two-disc set features a number of behind-the-scenes looks at all of the elements that went into creating the mayhem in the film. Where the film really falls down is that, as fun as it is, and as good an homage as it may be, it has the feeling of all being very recycled. Save the notion of the leg-gun, nothing in the movie feels new or different — there's just more of it and it's made with more money (without more money one cannot use a computer to digitally remove McGowan's leg and put a gun in its place). 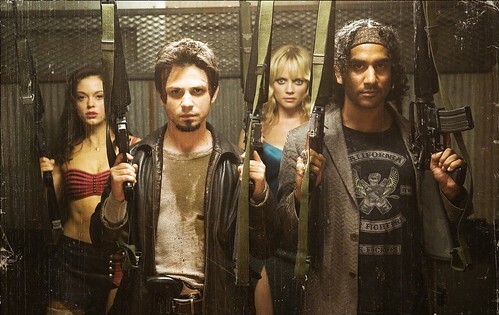 That may not make Planet Terror any less fun, but it does make it somewhat less interesting. These faults are both the greatest strength and weakness of Planet Terror. It is a movie that, as fun as it is, through the somewhat recycled nature of the material, “scratches,” and “missing” reels shows exactly why the movies and theaters being paid tribute to no longer exist.